Junior Evan Waldmann will study forest ecology at Harvard as part of a National Science Foundation Research Experience for Undergraduates grant. UCF student Evan Waldmann will study how natural versus human-created sounds effect wildlife at Harvard this summer. 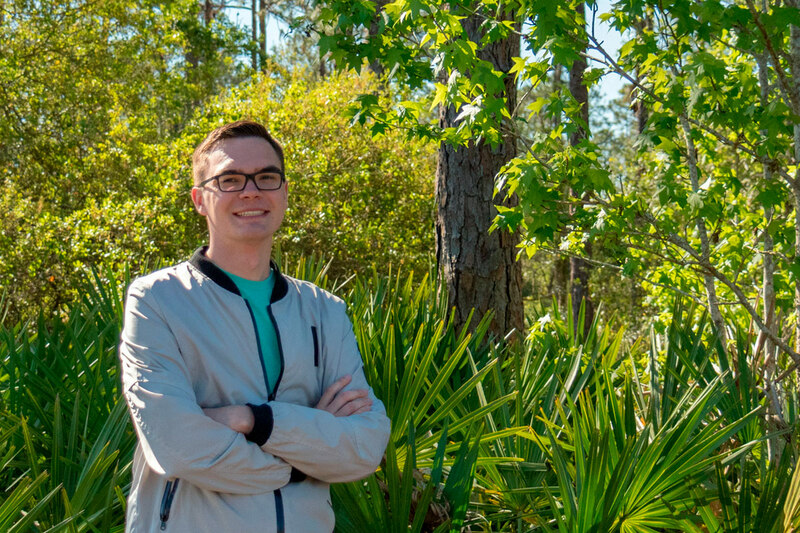 A UCF math major is headed to Harvard University this summer to study forest ecology through an interdisciplinary research project that combines philosophy, math algorithms and principles of ecology. Evan Waldmann credits working with Assistant Professor of Philosophy Jonathan Beever and his team for helping him land a Research Experience for Undergraduates grant from the National Science Foundation. “[My research will help provide] better justifications for conservation of lands in danger of being destroyed from things like urban sprawl and pollution, created by the current rapid expansion of human populations,” Waldmann says. Waldmann has been investigating the relationship between sounds that are perceived as natural and those that are human-created. Understanding that relationship is important especially here in Central Florida, which faces extensive suburban development. Soundscape ecology can track the effects of that development on wildlife and provide data to help measure public perception of noise, from vehicle traffic to social events. To advance this goal, Waldmann helped analyze a vast data set of natural and human-made sounds using “big data” algorithms written in the R programming language. At the same time, he learned principles of ecology and the knowledge- and value-claims that support them. Waldmann, a third-year honors student who plans to pursue a doctorate in theoretical neuroscience or machine learning, said he is excited about having the opportunity to work with Harvard senior ecologist Jonathan Thompson, a leader in forest ecology. The REU is a highly competitive grant program that gives students an opportunity to participate in challenging research projects nationwide. The grants include a stipend and in many cases assistance with travel and housing. If you are a student interested in applying for a National Science Foundation Research Experience for Undergraduates grant or other STEM scholarships, please contact the Office of Prestigious Awards at opa@ucf.edu.